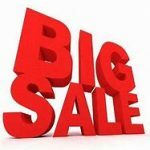 HUGE SALE STRING JUNE 2ND. Home/Uncategorized/HUGE SALE STRING JUNE 2ND. WE ARE HAVING NEW SALE STARTING SATURDAY JUNE 2ND. HOPE EVERYONE HAVE HAD A CHANCE TO DUST OF THEIR CARS AND GO FOR A CRUISE. THE NICE WEATHER IS HERE. IF ANYONE KNOWS OF ANY GREAT SHOWS WE COULD GO TO PLEASE SHARE WITH US SO WE CAN LET EVERYONE KNOW. By bobevans@gmx.com|2018-05-30T21:06:36+00:00May 30th, 2018|Uncategorized|Comments Off on HUGE SALE STRING JUNE 2ND.